We provide a caring, respectful and dignified delivery of the ashes of loved ones to the sea. We are a small company that provides individualized and personal services. Annual visit trips can be arranged to cruise by the site that cremains were distributed to, at the same GPS coordinates, for a special rate. We offer year round, cost effective, attended or unattended traditional ash scattering memorial cruises and complete full body casket using our Atlantic & Pacific Sea Burial Shroud™ for Eco Friendly Sea Burials per USCG regulations. Scatterings are presided over by the captain and for a full body burial at sea a funeral director is required for full body committals. We serve all faiths with personalized services. Each event includes an official ship’s parchment sea burial certificate marking the coordinates of the decedent’s final resting place, eight bell end of watch blessing and a ten gauge cannon salute as the ship circles the flower field and there are many more options to choose from. We provide a caring, respectful and dignified delivery of the ashes of loved ones to the sea. We provide individualized and personal services. 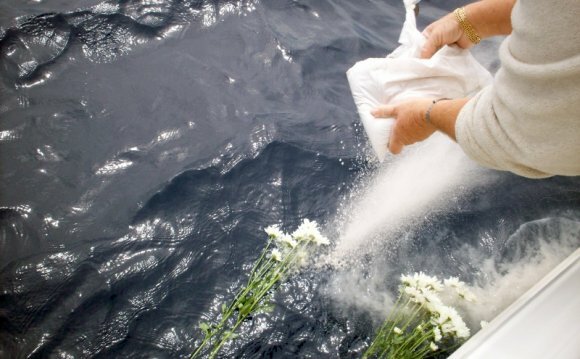 Scattering cremated remains at sea is a common and eco-friendly choice. We are not funeral directors, but regularly recommend Sea Burial Certified™ participating funeral directors near you from over 500 skilled participants across the USA who can easily discuss your pre or at need plan details. Their costs are not included here. One call does it all toll free (877) 897-7700 to learn more. The role of the maritimeprovider is multifaceted, almost like an event planner. The maritime provider can organize the vessel, catering and music, but the primary responsibility is to charter a safe and appropriate vessel and to counsel the family. Annual visit trips can be arranged to cruise by the site that cremated remains were distributed to, at the same GPS coordinates, for a special rate. All services include a certificate marking the latitude and longitude of your loved ones’ ashes. Unattended Ash Scatterings start at $495. A single flower, rose petals or an ocean friendly floral wreath. Eco-frinedly urns that temporarily contain the ashes to provide a longer lasting visual presence vs scattered ashes. Permanent, underwater memorials housing ashes in a living, under water eco system.